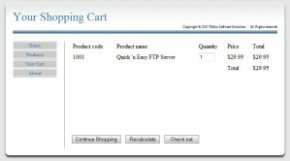 In this tutorial we will show you how to get started building a simple shopping cart with Quick n Easy Web Builder and PHP. 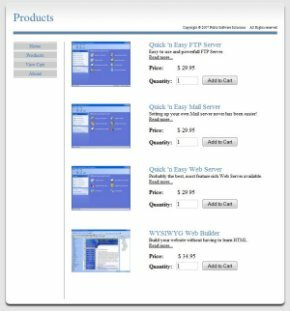 Note that this article does not provide a complete/fully featured web shop solution; it will just give you a basic idea how a web shop could be implemented in our software. 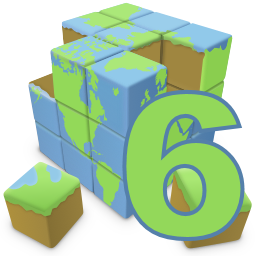 Quick 'n Easy Web Builder 1.5.6 or newer. Requires PHP installed on the webserver! The complete tutorial is available for download in PDF format, it also includes a demo project so you do not have to copy/paste all code if you want to experiment with this shopping cart. 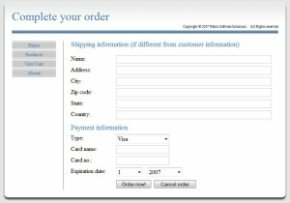 This example is not a replacement for a professional (database driven) ecommerce solution like oscommerce or Magento. However you can easily integrate this lightweight solution into your Web Builder website and you will have full control over the look and feel. To keep this example as clean as possible we left out most of the input validation, but you can easily add this yourself using the form validation tools in Quick 'n Easy Web Builder. You must have some basic knowledge of PHP to be able to modify this example!